Lynchburg,VA & Richmond,VA here we come! Our first order has arrived at Health Nut Nutrition in Lynchburg! 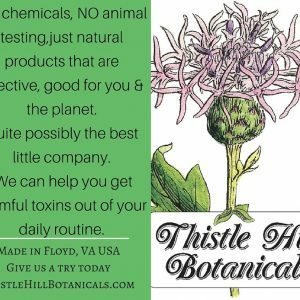 Stop by and see Alva or Dave and check out their display of Thistle Hill Botanicals products! Our first order is in transit as I write this to Ellwood Thompson’s in Richmond, VA! If you love buying local/regionally and you love natural and effective products check out the above stores! Tell your friends!